Back in 1978 when my hair was thick and my money was thin, construction began on what was initially called the Appalachian Highway. After almost 40 years of work that proceeded at times at the pace of a tipsy turtle, it opened for travelers this week on the summer solstice. Our friend Denise, who we hadn’t seen in more than 15 years, visited this past weekend and on Monday I had to take her to Birmingham for meetings before she boarded her flight back to Colorado. As we exited off Highway 78 onto I-22 near Graysville, I realized that the last leg of the highway construction would officially open around midday. I told her about the road’s history and said that we might be among the first people to christen it. As we approached the new section, troopers still had it closed. I could tell she was a little disappointed when we exited off onto Coalburg Road. The 20-minute drive to drop her off at the hotel gave the news media time to capture posing politicians snipping the red ribbon. My phone buzzed as the story happened. On the return trip, my truck almost took the detour exit out of habit, but I merged to the left for another half mile to the Memphis exit onto I-22. While I was not the first traveler, I was among the first to drive over the newly opened highway. The tires of my truck sang on the new surface of the concrete overpasses. It was a historic moment, and I rested my iPhone on the steering wheel to document the event. Mimosa trees lining the banks along the highway were in full bloom and looked like pink clouds against the summer sky. I’d traveled less than a half-mile when I had to dodge debris. An 18-wheeler just off the edge of the road had the distinction of being the first trucker to have a blowout on the historic highway. When I reached my exit and turned onto the Bankhead Highway, traffic was thin. Slowing to a more leisurely pace, it occurred to me that I remembered when this highway was new as well. The local stretch of Bankhead Highway between Walker County and Birmingham was initially a two-lane road. When the highway department widened it into four lanes in the early 1960s, people here were abuzz with excitement. Even though I was young, I remember hearing people who drove daily into Birmingham say how much time the new highway would save them. Before the road widened into four lanes, commuters often crept up the long hills and hollows behind 18 wheelers between Walker County and Birmingham. The commute was brutal. After high school, I landed a job in Birmingham. Even with the four lanes, the commute still took me two hours each day. I did this for more than 30 years. The new I-22 cuts travel time about 15 minutes each way. Had the road been completed back in 1983, I would have saved six months (I did the math) of my life. Completion of this road is a milestone. I think it will make our little corner of the world more accessible, bringing in new business and opportunities for employment. I’m happy I lived to see it completed. A great story my friend, we were riding along with you. I enjoy your ability to 'take someone along'. Funny about the time (the 6 months of your life), I have a problem my mind forces me into using math in comparisons. Sorry Denise did not get to 'ride the road'. 40 years seems a little long. I think they built the pyramids faster. Here in my town, I waited years for the road to my work to be completed. Fighting construction for years it was such a pleasure to drive on new surface. I think it even made me go faster. It's nice to have a time-saving new road. 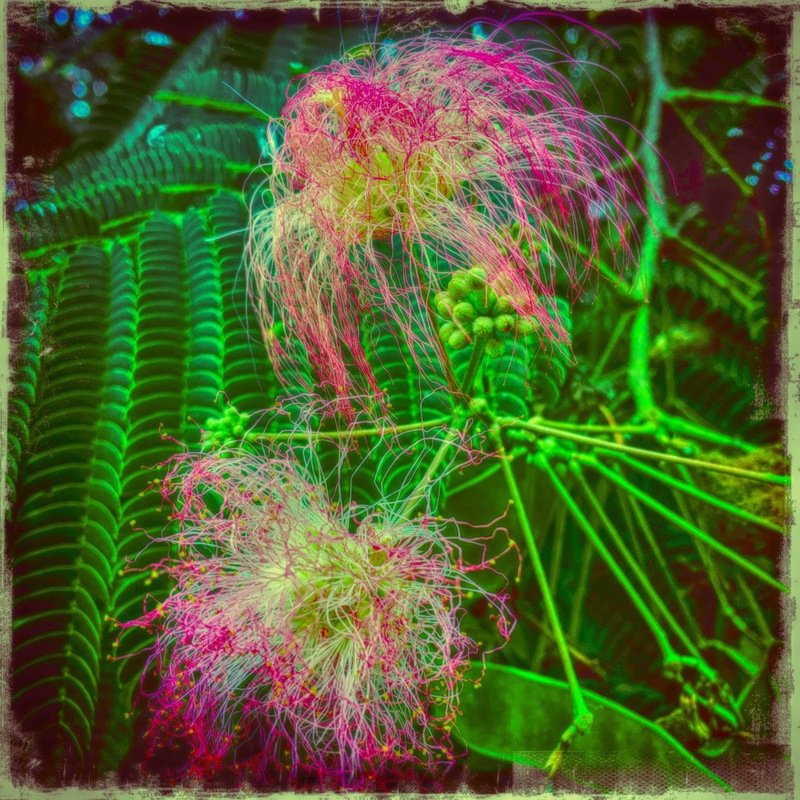 I like the mimosa blossoms. To me, they indicate that summer is in full swing. The blossoms look so soft and yet stand up to the heat and humidity. Forty years? WOW! That was certainly job security building it. We drove it for the first time this week. I was struck by how beautiful the view is from the highway,lush and verdant with mists rising from the hollows. Are those mimosa blossoms? They're beautiful!! Yes these are mimosa blossoms. You are now a part of history. And that is one of the most beautiful pictures I have ever seen. I am sad that I missed that part of history by an hour!